WOW! Want to invest in Harbour Isle East in a Penthouse condo overlooking the beautiful inlet!?! This condo is being offered as an investment property with lease in place! Harbour Isle East permits 2 chairs and table (white)on the catwalk so the views of the inlet are amazing. This condo has a new A/C and new water heater! Newer stainless steel smudge proof refrigerator and dishwasher too! Almost 2000 SF of living space, 10' ceilings, EXCELLENT parking and proximity to the pool, fitness center, bocce, tennis and BBQ grill area! Call for your private showing today! If you are looking for a penthouse unit in Harbour Isle West for under 300K, well here it is! Very clean condo with upgraded ceiling fans and light fixtures, call for your private showing today! 2/2, almost 2000 SF, 10' ceilings, granite countertops in kitchen and baths and view of the canal entry into the Harbour Isle Marina! Watch boats coming in and out and of course the sweet dolphins at play! A great opportunity to buy in the attractive Harbour Isles East, Manned and Gated Community located on desirable South Hutchinson Island. This sought after, waterfront 2 bed/2 bath Penthouse is overlooking the Marina. The condo consists of a large master bedroom facing the water and offers a tub and shower bath with both his and her sinks and closets. A storage area and large Florida room w/ sliding glass doors to allow for grand views of the Marina. The laundry area has a wash sink. An additional room for private office/den. The finest attraction is having the ocean, river, and inlet at your back door as well as the resort-style amenities-Clubhouse, pool, hot tub, gym, Bocci Ball, clay tennis courts and beautiful walkways around the property. A close walk to surrounding restaurants! 1 mile from the Atlantic Ocean sits Harbour Isle... Hutchinson Islands premier, gated waterfront community nestled between the Indian River and Fort Pierce Inlet! 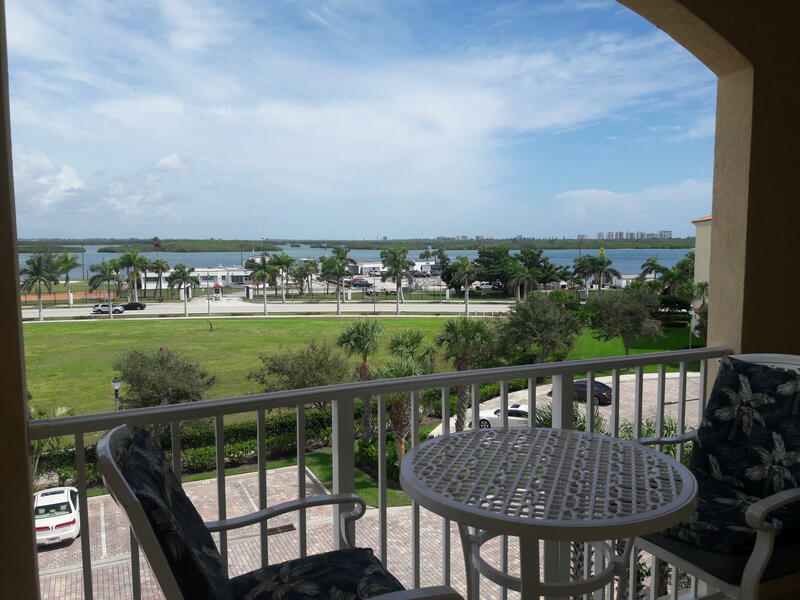 This extremely rare 4th floor corner penthouse has majestic views of the Harbour Isle marina and Fort Pierce inlet. This home has almost 2000 sf under air, 2 bedrooms, 2 full baths, plus a den or office, extra interior storage room, open spacious eat in kitchen and living areas, granite and 42'' cabinets in the kitchen, 10 foot ceilings throughout, sun room with floor to ceiling sliding glass doors that open to your peaceful view of the marina, plush upgraded carpet and crown molding throughout. Harbour Isle offers a luxurious Florida lifestyle with resort style pool, fitness center, clubhouse, marina with deep water dockage. The Best Building in Harbour Isle. Full southern view of Intracoastal all the way to Jensen Beach.Custom Paint. View says it all!!! Welcome to your very own elegantly decorated penthouse condo in Harbour Isle with stunning marina views! 2/2, almost 2000 sf, granite in the kitchen and baths, crown molding throughout! Designer wallpaper, custom draperies and even a built in wall unit in the master bedroom! Chandeliers are present in most spaces as this condo was designer decorated. This beautiful home is being offered fully furnished and turnkey. Call for your private showing. You will be rendered speechless! If you have been waiting for an END unit PENTHOUSE in building 36 with ABSOLUTELY STUNNING VIEWS FOR MILES, then wait no further! This penthouse condo is gorgeous with real wood planked floors which begin your journey into your island oasis. Plantation shutters and a kitchen with full size 36'' french door stainless steel profile refrigerator, stainless steel appliances including an induction slide in cooktop range! The sellers even have a custom stainless steel etched backsplash which creates a beautiful ambiance in the kitchen. The den has been converted to a beautiful guest bedroom and office space! You will be wowed in this gorgeous condo. A/C was also replaced about 1.5 years ago! FURNISHINGS INCLUDED! Call for your private showing! Owner Financing. Stunning direct waterfront views from this large Penthouse. This is the best location in the Renaissance, direct riverfront--an opportunity that doesn't come along often. The residence has tall ceilings and spacious great room opening to a wide balcony and amazing sunrises on the water. Gorgeous wood floors throughout. Master has its own balcony and Jacuzzi tub, big shower, dual sinks. 2 guest bedrooms with walk in closets and lots of storage plus laundry room. The Renaissance offers rooftop heated pool, hot tub, clubhouse, exercise room, sauna, billiards room, cook out area. Separate private storage room and covered garage parking. Best downtown location to walk to marinas, restaurants, Sunrise Theater, Art District and 2 miles to the beach. Owner is motivated ! 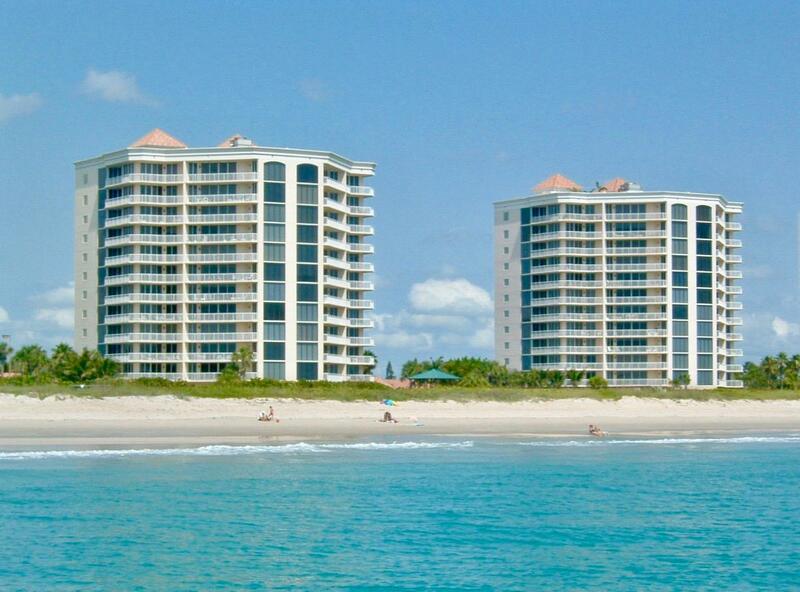 One of the most spectacular views on Hutchinson island! This beautiful newly updated condo is nestled among 3000 acres of preserves. Great views of the AtlanticOcean and Indian River. A rare 3 bedroom unit with1 car underground parking space.. Private Oceanfront beach with crosswalk is offered to the residents. New SS appliances and upgraded ceiling fans. The gated community offers pool, tennis courts, shuffleboard, kayak launch, with a key code to access building and elevators.Tile and bamboo flooring through-out the unit. Gourmet kitchen, split floor plan, custom lighting, designer touches through-out the unit. . Rare 3 bedroom 3 bath condo Custom tile through-out the bathrooms. Ocean and river views highlight the morning sunrises and evening sunsets. Simply stunning! !